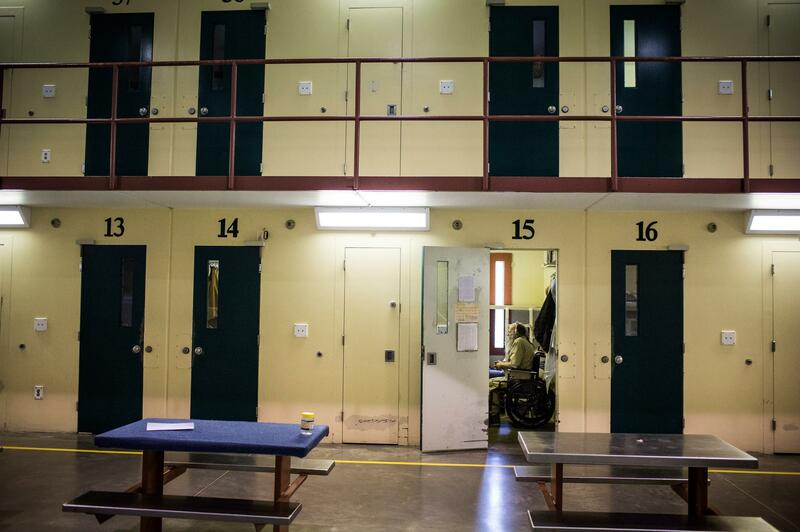 A view inside Rhode Island's John J. Moran Medium Security Prison, in Cranston. Rhode Island is the only state to screen every individual who comes into the correctional system for opioid use disorder, and to offer, in conjunction with with counseling, all three medically effective treatments. "At 26 years old, I experimented with heroin," says Kevin, 50. "I wasn't the person that I wanted to be. Once I put that in my system, I felt like this is what I'm supposed to do and this is what I'm supposed to feel like." This group therapy session is part of a $2 million program the Rhode Island Department of Corrections launched in 2016. These men are all serving prison sentences for crimes driven by their drug addiction — including robbery, shoplifting and possession of controlled substances. NPR agreed to only use their first names so they could speak frankly about illegal behavior. They are among the approximately 275 inmates and pretrial detainees getting medication-assisted treatment behind bars. The program is central to Rhode Island Gov. Gina Raimondo's strategy to reduce opioid overdose deaths in the state. Today, Rhode Island remains the only state to screen every individual who comes into the correctional system for opioid use disorder, and to offer, along with drug counseling, all three types of drugs approved by the Food and Drug Administration to treat addiction — methadone, buprenorphine and naltrexone. While prisons have long offered medication-assisted treatment to small subsets of inmates, such as pregnant women, many prisons in the U.S. do not offer it at all, despite the fact that it's considered by physicians to be the most effective treatment for opioid addiction. The criminal justice reform bill currently before Congress would require the Federal Bureau of Prisons to assess its capacity to provide medication-assisted treatment to inmates who are dependent on opioids, and to draw up plans to expand access to medically aided treatment "where appropriate." But the bill leaves open who would determine when and where the medication is appropriate. "It's just ludicrous that we have a whole population of people who are by and large incarcerated because of their disease, and we have an effective medication treatment for the disease and we don't give it to them," says Dr. Josiah Rich, director of the Center for Prisoner Health and Human Rights at the Miriam Hospital in Providence. Rich was one of the experts tapped by Raimondo to identify where best to direct resources to bring down the state's overdose deaths. He made the case for a prison program, given the high death rate among people recently incarcerated. 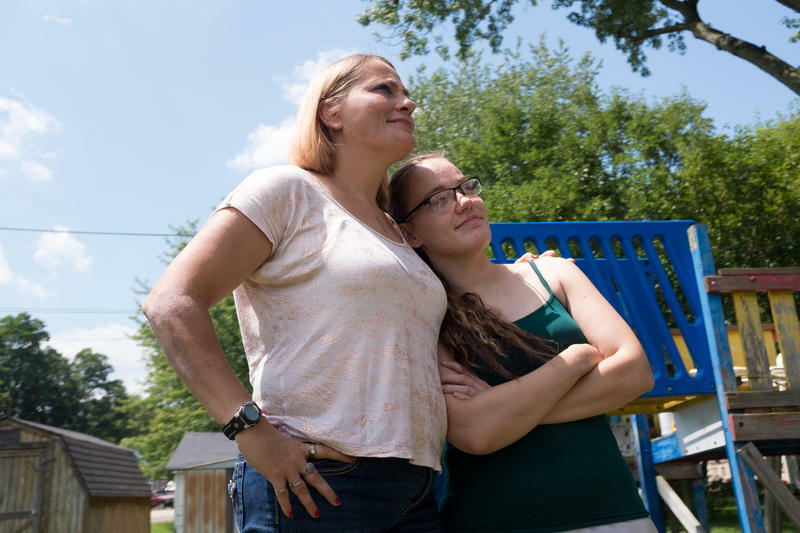 "This is a population of the most severely impacted, the most advanced stages of opioid use disorder — the people who have taken the greatest risks and gotten caught up in the system," Rich says. While in prison, the inmates' opioid use usually ends, and so does their ability to tolerate high doses of the drugs without overdosing. "Then you get released into a very stressful situation with a lot of triggers, and you typically relapse," Rich says. "And if you relapse back to the same level you were using, you're set up for overdose and death." This is what drove the Rhode Island Department of Corrections to offer medication-assisted treatment not just to people coming into prison, but also to those who began serving their sentences before the program existed. Eight to 12 weeks before their release, inmates with histories of addiction are offered methadone, buprenorphine or naltrexone to ease their transition back to society, beginning with very low doses. "Even if somebody has not used in many years, they may still have changes in their brain," says Dr. Jennifer Clarke, the Department of Corrections medical programs director. "The cravings are always going to be there. So, if somebody's going back to the same old neighborhood, chances are they're going to be exposed to the same people as when they were using drugs. "So, providing the medication before someone gets out really helps to prevent a relapse," Clarke says. The possibility of relapse is top of mind for the men in group therapy. They have friends who have overdosed and died after serving time. Kevin has just a few weeks left in his sentence, one of many that he's served in his adult life. "It feels good, but I'm nervous. I always get nervous," he says. "As soon as I walk out the gates — my feet, when they hit the pavement outside of here, I have to get busy immediately." "You worry about the drug aspect once you hit the street," says Josh who has also served multiple sentences for drug-related crimes. "Many times, I've gone out of here and overdosed repeatedly. Not on purpose, just accidentally, trying to hide from the pain, hide from myself." This time, Josh says, the treatment program has given him a way to focus on a different way out. "I still have to fight the other drugs," he says. "But at least I have something to help with one of the ones that's brought me closer to death than anything else." The program inside the prison is run by CODAC, a behavioral healthcare organization that also runs substance abuse treatment programs outside the prison, with locations across Rhode Island. Prisoners who enter the program remain clients when they exit prison, with treatment outside typically paid for by Medicaid. Discharge planners from CODAC help the inmates get organized for that transition. "I already have counseling appointments lined up, doctors appointments lined up," says Ray, who is scheduled to be released in December. In prison, he's been taking buprenorphine, which he'll continue the day he gets out. "I really don't want to use heroin again." Early reports from the program are promising. In a study published in JAMA Psychiatry last spring, researchers found that overdose deaths among people who had recently been imprisoned dropped sharply in the first six months of 2017 as compared to the same period the year before — nine deaths, compared to 26. Researchers continue to track outcomes and are interviewing inmates and correctional staff to learn more about how well the program is functioning. There have been hurdles to overcome, says Lauranne Howard, substance abuse coordinator for the Department of Corrections, starting with resistance from security staff about the use of buprenorphine in the program. Buprenorphine itself is an opioid, though less potent than street drugs in many of its effects, and sometimes ends up sold or given to people outside its intended use. "The reaction was, why are you going to bring in a medication that we're working real hard to keep out? And that's a legitimate concern," Howard says. In response, the program has made some changes. CODAC's Leslie Barber, who directs the prison program and runs the group therapy sessions, says they launched the program using buprenorphine pills, which take awhile to dissolve. "We compromised by switching to the films which, although more expensive, dissolve quicker," she says. CODAC says the buprenorphine pills cost approximately $4 each, while the films cost approximately $8 each. A number of other states have taken notice and sent corrections officials to Rhode Island to learn from their experiences. Clarke points out that Rhode Island has the advantage of being a small state with a combined jail and prison system, so that everyone who is incarcerated comes to the same campus. When an inmate is transferred from jail to prison, there is no disruption in treatment. In other states, it's more complicated. For example, Rikers Island in New York City offers medication-assisted treatment to all medically eligible inmates, but those who are sentenced to time in a state prison where treatment is not offered have to be tapered off methadone or buprenorphine before they leave Rikers Island. Patricia Coyne-Fague, acting director of corrections for Rhode Island, recognizes that even with medication-assisted treatment, people will stumble and make mistakes — even end up reincarcerated. Still, she defends Rhode Island's $2 million annual expenditure with the argument that the program saves lives. "Sometimes there can be a negative attitude about whose lives we are saving," she says. "But everybody belongs to somebody. And so, while they may have committed a crime and deserve to be incarcerated, they're still human beings. And if we can keep people from dying, that's a good thing." More than a hundred Americans die from opioid overdoses every day. From 2015 to 2016, opioid overdose deaths in the U.S. went up by 28 percent. A few years ago, Rhode Island's governor asked some experts to look for ways to address this problem. And when they took a close look at who was dying from overdoses, they realized that one place offered a huge opportunity for an intervention. SHAPIRO: Prison. Dr. Jody Rich of Brown University was on the task force. JODY RICH: I mean, it's just ludicrous that we have a whole population of people who are by and large being incarcerated, caught up in the criminal justice system because of their disease. And we have an effective medication treatment for this disease, and we don't give it to them. SHAPIRO: Many prisoners wind up behind bars for crimes that feed their addiction like burglary or drug possession. When they get out of prison, they often relapse without the same opioid tolerance they had before. RICH: And if you relapse back to the same level that you were using, you're set up for overdose and death. SHAPIRO: At the John J. Moran Medium Security Facility in Cranston, R.I., inmates are playing basketball in the yard on a sunny afternoon. Everyone who enters the correctional system in Rhode Island is screened for opioid addiction. And everyone who has an addiction is offered medication-assisted treatment, meds like methadone, Suboxone and Vivitrol that can reduce cravings and help people stop abusing. This is considered the most effective form of treatment for opioid addiction, but the vast majority of Americans with this disorder don't get these medications. At this prison, about 10 percent of the inmates are on one of the therapy drugs. UNIDENTIFIED PERSON #2: I brought some footnotes. UNIDENTIFIED PERSON #3: You came prepared. SHAPIRO: Group therapy is part of the program, too, and we sat in on a session in a classroom. We're only using the inmates' first names so they can speak frankly about illegal behavior. A goateed 23-year-old named Ray is here for robbery. He describes his experience arriving here a few years ago before this treatment program existed. RAY: It was a rough detox in a cell. I was sick for a good 30 days - you know, the physical aspect. The mental aspect - I mean, I didn't get a good night's sleep for at least six months. There was no counseling when I came in. There was really nothing - three in a cell and told you to go to chow and everything. SHAPIRO: That's pretty typical of American prisons. A 39-year-old-man named Josh has a history of drug offenses and prison time going back years. JOSH: Time wasted from my kids, time wasted from my family, time wasted from my life all because of drugs. Pretty much every time I got out of here, I overdosed repeatedly. SHAPIRO: You know, one real fear is that people will die of an overdose because their resistance goes down when they're incarcerated. Do you know people who've lost their lives that way? KEVIN: Very good friends. I had two very good friends. SHAPIRO: That's Kevin, a man with a salt-and-pepper beard. He's serving time for shoplifting. Josh says he's seen the same thing. JOSH: I had a close friend die right in the other room. Yeah, just a lot of people. I had quite a few right in my hands. It's a horrible thing. SHAPIRO: This program in Rhode Island costs $2 million a year. That's money the state could have used to improve schools or roads. So I asked Patricia Coyne-Fague, the acting director of Rhode Island's Department of Corrections, what she says to skeptical politicians when they ask why this program is worth the money. PATRICIA COYNE-FAGUE: It saves people's lives. Sometimes there can be a negative attitude about whose lives we're saving. But, you know, everybody belongs to somebody. And so while they may have committed crime and deserve to be incarcerated, they're still human beings. And if we can keep people from dying, that's a good thing. SHAPIRO: And early evidence shows that this program is keeping people from dying. In the first six months of last year, researchers saw a significant drop in overdose deaths among people recently released from prison. The prison system's medical director, Dr. Jennifer Clarke, believes this will actually save money in the long run. She says, look at who tends to die from overdoses. JENNIFER CLARKE: They are typically young. Many of them are young parents. So it's not just the life of the individual. It's the whole family. It's a whole community that's affected. So all analyses that have been done have really shown that the money we spend on treating people - you save money in other areas of society. SHAPIRO: When you look at the impact that this program has had in the last couple years, do you think it's something that every prison in every state all over the United States ought to do? CLARKE: Yes, definitely, without a doubt. SHAPIRO: And a lot of other states are interested. Corrections officials from around the country regularly come here to see how the program works. One big piece of advice the Rhode Island staff gives - get the prison guards on board. Lauranne Howard is the substance abuse coordinator here, and she's had to work closely with the security staff. LAURANNE HOWARD: The reaction was, why are you going to bring in a medication that we're working real hard to keep out? SHAPIRO: So how did you overcome that? HOWARD: And that's a legitimate concern. We had to have meetings. We did a lot of talking. We did a lot of education. SHAPIRO: See; a drug like Suboxone is itself an opioid, so inmates might take a pill that's intended for treatment and sell it or give it to someone else. They've tweaked the program to deal with those concerns, switching from pills to strips that dissolve faster. SHAPIRO: Lauranne Howard helps run the therapy sessions. And on the day we dropped in, two of the men had a very specific fear. Twenty-three-year-old Ray and 50-year-old Kevin are both getting out soon. KEVIN: It feels good, but it's like I'm nervous. I'm nervous. I always get nervous. SHAPIRO: Kevin knows what he has to do when he gets out to make sure he doesn't relapse again. KEVIN: My feet - when they hit the pavement outside of here, I have to get busy immediately. So I need to get a job, like, right away. SHAPIRO: Ray is bracing for re-entry, too. RAY: I already have it lined up. I already have counseling appointments lined up, doctor's appointments lined up. SHAPIRO: It helps that the substance abuse organization running the program inside the prison also has centers on the outside all over the state. It's a group called CODAC. Lauranne Howard reminds Kevin and Ray that they won't be on their own when they leave here. HOWARD: You can get your medication the day that you leave. And then the very next day, you can go into a CODAC program and get your medication again. SHAPIRO: We asked to meet someone who has already been released, and the staff introduced us to Michael Manfredi in an office building near the prison. He's been out for a few years and works in construction now. MICHAEL MANFREDI: I started at 10 years old smoking marijuana. And I became a heroin addict at 15 years old. And it just progressed, and numerous incarcerations due to my drug addiction. SHAPIRO: He's 55. The last time he got locked up, he got on Vivitrol as part of an earlier, smaller program. Does it seem strange that the program that finally helped you escape this was a program that you had to be incarcerated (laughter) to get access to? MANFREDI: It was the best thing for me to do to get incarcerated because either I was going to die, or I was going to hurt somebody and never come out again. So the best thing that happened to me - and it's not a nice thing to say, but incarceration was the only alternative for me. SHAPIRO: And how does it feel after so many years of addiction and incarceration to be living this, quote, unquote, "normal life?" MANFREDI: I still don't believe it's happening, but it is. I'm up at 4 o'clock in the morning, out the door by quarter of 6. I put 10-hour days in. I go to a meeting sometimes five, six times a week. If not, I stay home, and I watch TV, and I play with my grandkids in the yard. SHAPIRO: When you were in the depths of your addiction, did you ever imagine you could have that kind of a life? MANFREDI: No. I didn't think it existed. Never thought it would exist - never. Never. SHAPIRO: So far, Rhode Island is the only state in the country with this comprehensive of a program. Last year, while opioid overdose deaths went up nationally, Rhode Island was one of just a handful of states that reported the numbers went down. Transcript provided by NPR, Copyright NPR. On April 17, Katie Herzog checked into a Boston teaching hospital for what turned out to be a nine-hour-long back surgery. 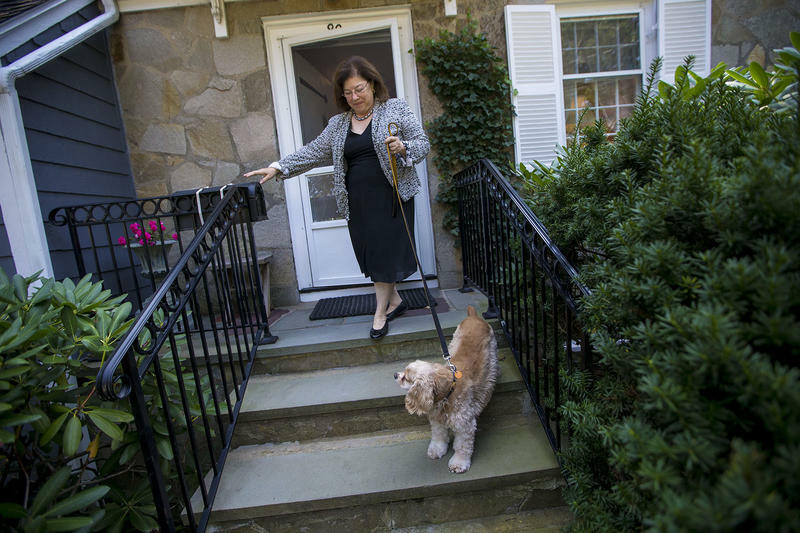 The 68-year-old consulting firm president left the hospital with a prescription for Dilaudid, an opioid used to treat severe pain, and instructions to take two pills every four hours, as needed. Herzog took close to the full dose for about two weeks. Then, worried about addiction, she began asking questions.